• Thema anzeigen - The Last Chance. For A Future Without Need. The Last Chance. For A Future Without Need. Betreff des Beitrags: The Last Chance. For A Future Without Need. The project has just started. Project details and present results soon to come at this place. I don't know, but 'need' sounds strange. I'd translate 'Not' into 'misery', not need. The Last Chance for a Future Without Misery. You better doublecheck this with a native English speaker. I am a native English speaker, fluent in Spanish, who would like to help translate any of the books or articles of Raoul or Annie France into English, if there is a project like this in the works. Please let me know if there is any way I can help. I have worked as a journalist and translater as proofreader. we would highly appreciate the translation of the works of the France's ! please bear in mind that we are a non profit group of enthusiats and have no money at all. We are all working voluntary for free because we are convinced that the world must know what the France's still have to say. Please tell me under what conditions you are willing to do translations. I wonder how did you found the website and what are your interests in France. I am so glad you wrote so soon. First because I was not sure the computer (in the library!) sent you my email! on 18 hectares of land in Catalonia (outside Tarragona). Who knows more about life in the soil and the importance of its creation and maintenence than these two brilliant scientists? So now that we have these points clear, please let me know what I can do to help. YOU ARE SENT FROM HEAVEN ! We desperatly need translaters ! Even more when they know the works of the France's and even more when they are experienced in the APPLICATION of their scientific findings ! Since two years I'm studying their literature. Since two years I'm searching for their estate und finally now I know ALL the people who own the original Dokuments of the France's, e.g. Landesmuseum Linz, Austria; Rene Roth, Canada (died Summer 2010, I'm in contact with his daughter) and Pierre France, grandson of Raoul France, Paris. I was in the local town bar of the village near where we have the reforestation project, on the pay computer and had two minutes left so I saw your email and had to answer. It was a short answer and now I would like to write you a bit more of an answer. We have been working and living on 18 hectars of land since 1994 and are trying to build humus, to plant a living forest (instead of a soil-sick half dead one) on land that has no soil to speak of. Very bad conditions. We were recommended way back at the beginning to read France or Harrar to find out how to cultivate humus in the right way. Big problem. I can't read german enough to get through any of the books. Nor could we find copies of them. So I have been soooooo happy to hear about your project. At last we will be able to contribute to something that not only will help us with our project but will help thousands of other people for years to come. So send me some pages to edit or help proof read. I am at your disposal, eager to get to work on this. Tell me more about your group and project. At least: a native english speaker, fluent in spain, basic understanding of german AND an experienced expert in reforestation ! What do we want more ..
A Russian native speaker who translates it into Russian, because there a many naturalists do live and could contribute to the project. On top a Chinese native speaker would be good to get it translated into Chinese. This because China has an very old culture and because their style of thinking, their philosophy could really help to get a view from a different angle. So, a Russian and Chinese translator is on my wish list. If I could I would like to ask Wladimir Kaminer. He has a "Schrebergarten" in Berlin, wrote a book and made a video feature about it. And on top he is a funny man. During my professional time at FESTO DIDACTIC http://www.festo-didactic.com I published many books and dictionaries. For example "Grundlagen der Steuerungstechnik" in Chinese - even in two dialects. The translator from a chinese university worked with IBM PC and chinese DOS OS. But at present I don't know of any chinese who we can ask. And today they are more after the western style of destroing the world than keep their agriculture heritage alive. Annie France hat NOCH VOR der Herausgabe des gedruckten Buches Kontakt mit Einstein gehabt, d.h. Einstein hat schon das MANUSKRIPT des Buches gelesen. Annie France-Harrar hat offensichtlich Einstein gebeten, bei der ÜBERSETZUNG des Buches ins ENGLISCHE zu helfen ! Das heißt, seit 60 JAHREN WARTET DAS BUCH SCHON AUF SEINE ÜBERSETZUNG !!! KEINER der "France-Propagandisten" hat es bisher geschafft eine Übersetzung in die Weltsprache Englisch zu vollbringen. EIN SKANDAL ! Und eine Schande ! Für alle beteiligten Personen ! Trotz der positiven Ankündigung von Einstein ist die Übersetzung wohl letzten Endes doch nicht zustande gekommen. 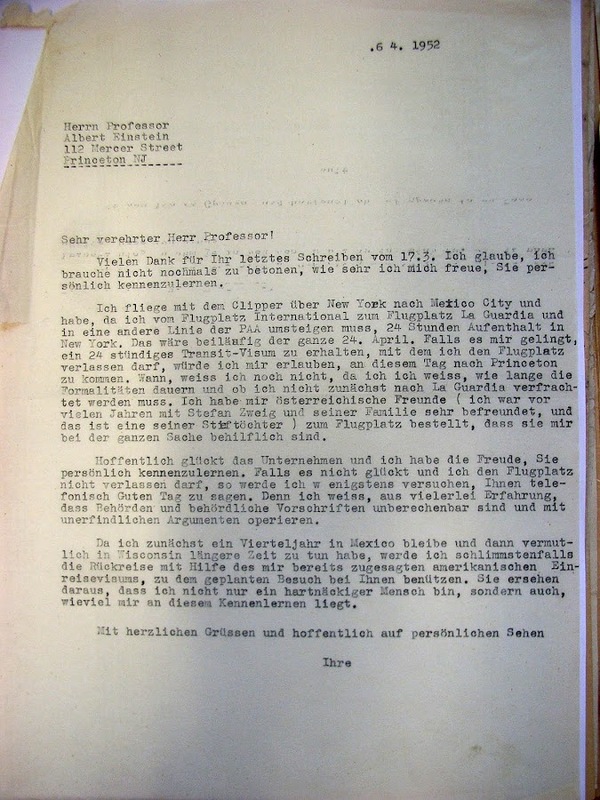 Auch ein vereinbartes persönliches Treffen von Annie und Einstein in den USA ist wohl doch nicht erfolgt. Und wir brauchen auch keine veranschlagten 30.000 Euro dazu. Nur Interesse, Lust und Laune. Was wohl das Albert Einstein Archiv in Israel sagt ? The Einstein Archives Online Website provides the first online access to Albert Einstein’s scientific and non-scientific manuscripts held by the Albert Einstein Archives at the Hebrew University of Jerusalem and to an extensive Archival Database, constituting the material record of one of the most influential intellects in the modern era. 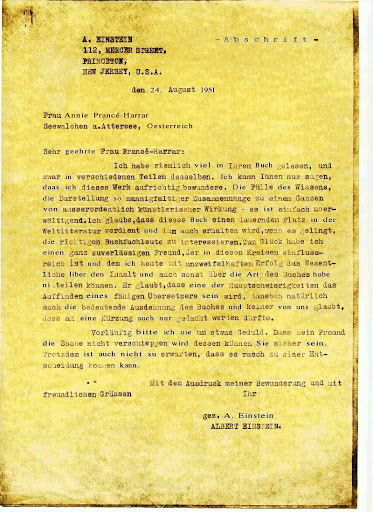 Leider kann man die Briefe nicht online lesen ..
Vielleicht können wir vom Einstein Archiv in Israel eine Kopie aller Briefe von Albert Einstein und Annie France-Harrar bekommen. ES MUß "NUR" "JEMAND" DIESE ARBEIT MACHEN ! A snippet from the ongoing translation process. There are approximatly 3 - 6 steps necessary to have a final translation of about 80 % correct in meaning, expression ad grammar. Could be still improved by proofreading by an expert in literacy and a technical expert. Ruth machine translates the german text into english with google translation tool. As a native english speaker she tries to transform these raw words into meaningful english. Because she has only a basic understandig of german I correct her english text so that the german meaning is transferred to english because I can understand better english than she understands german. Then she does again a refinement of my english corrections. Usually some more steps required. I also translate the german technical terms into english together with definition and pictures from the internet. "Die letzte Chance. Für eine Zukunft ohne Not." This looks like the best one. It sounds quite good in English! Ruth is native US American speaker. selber arbeite ich mit dem Wörterbuch der Landwirtschaft. (Deutsch, Englisch, Französisch, Spanisch, Italienisch, Russisch). Autoren: Haensch / Haberkamp. Internet hat uns nicht weitergeholfen. "Großer Wert wird dabei auf richtige und sachgemäße Terrassierung gelegt. sogar Faschinen als Stufenstützung an." Ob's in Deinem Superwörterbuch drinsteht ? vielleicht kann ich mal nachsehen im alten Schlipf-Landwirtschaftwerk... da ist nichts! Dans les fortifications, une fascine est un fagot composé de branchages d'environ deux mètres de long. A fascine (pronounced /fəˈsiːn/) is a rough bundle of brushwood used for strengthening an earthen structure, or making a path across uneven or wet terrain. Typical uses are protecting the banks of streams from erosion, covering marshy ground and so on. Das ist wahre virtuelle Gemeinschaftsarbeit gleichgesinnter Menschen zur Realisierung eines gemeinsamen großen Ziels ! Die France's und Einstein wirds freuen. Und irgendwann die Landwirte und Gärtner auf der ganzen Welt. Große Worte - gelassen ausgesprochen. Betreff des Beitrags: Re: The Last Chance. For A Future Without Need. Chapter 7 How can man finally remedy the loss of humus?